MCYD empowers young working people to make a difference in their community. We connect members with resources, endorse and elect candidates. Membership is open to registered Democrats age 18-35, and honorary associate memberships are available to all registered Democrats. 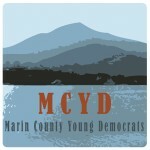 If you are interested in becoming an MCYD member please visit our Contact MCYD page and send us a message. Image | This entry was posted in Events, Meetings, Opportunities and tagged activism, Democratic Party, Marin County, Marin County Young Democrats, Marin County Young Dems, MCYD, political, young adults, Young Democrats, Young Dems. Bookmark the permalink.